Oil was also behind Baku's effort to develop an infrastructure related to water distribution. By the late 19th century, Baku's city planners had long been faced with a dire issue: water shortage. They were desperate to find a reliable, healthy source of water. The problem reached critical proportions by the mid-1800s and by the time the Oil Boom began in the 1870s, Baku had exhausted all known solutions, from channeling water from nearby rivers to building desalination plants. Finally, they sought international expertise and, after years of research and deliberation, the decision was made to bring water from the faraway foothills of the Caucasus Mountains. British civil engineer William Heerlein Lindley (1853-1917) coordinated the project for Baku's water supply system, working from 1899 up until his death in 1917. 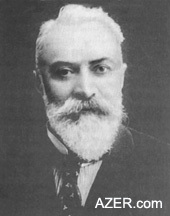 Having designed many of the water systems in Europe, he calculated that springs located high up in the Caucasus would provide a plentiful amount of water for Baku and its residents. He attempted something that had never been done before, not even in Europe. He constructed a pipeline, originating at the water source in the Caucasus mountains and extending 110 miles (177 km) south to Baku. It was the right decision. Even today, the Shollar pipeline remains vital to central Baku's water supply and is considered the most reliable, healthy source in the entire city. 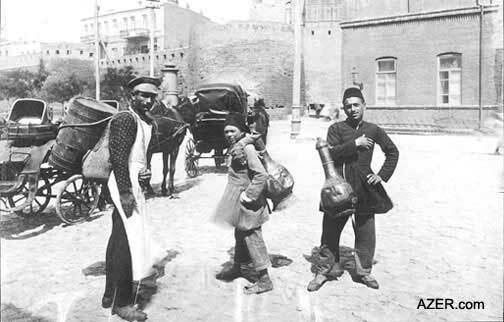 Above: Vendors selling water in the streets of Baku. Early 1900s. Dr. Ryszard Zelichowski, a Polish historian, was researching the relationship between hygiene and city engineering in 19th-century Warsaw when he discovered that the major water supply and sewage systems had been designed by British engineer William Lindley (1808-1900). Through extensive research, he learned of the eldest son's connection with waterworks in Baku. 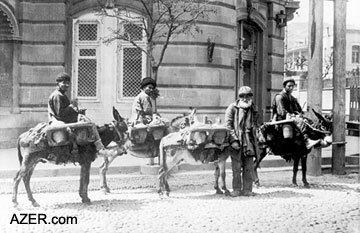 Left: Water vendors in Baku's streets before Shollar Water system was installed in 1917. Zelichowski's study is, in fact, part of a growing body of literature referred to as "Euro-Biography". His research identifies two major trends in Victorian engineering: (1) the incredible progress made by Western civilization, thanks to the ingenuity of these engineers in designing filtration systems for drinking water and in creating indoor plumbing, and (2) the profound legacy of these engineers as the first "true" Europeans who became deeply engaged in multiculturalism for the benefit of the entire region. In today's lingo, we might have called them "Engineers Without Borders". Here Zelichowski describes Baku's struggles to find a reliable, sufficient water supply, which Lindley himself described as "one of the most challenging projects he ever undertook in his entire life." 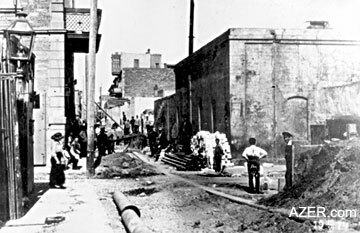 On January 28, 1899, the Baku Commission for Water Supply informed the provincial Baku Duma (Russian for "parliament") that it was seeking a project to provide a sewage and water supply system for the city. This water supply system would use the vast resources of water from the Samur and Kur rivers, enough to supply the city with 3 million buckets of water per day. Left: Sir William H. Lindley. With that goal in mind, the Commission applied to three different European civil engineers; one of them was William Heerlein Lindley (1853-1917). Lindley and his family were known throughout Europe for their feats of civil engineering. After beginning their activities in Germany, they had expanded to more than 30 cities in Central and Eastern Europe. Lindley responded to the Duma's letter on June 3, 1899. Accepting his conditions, the Duma sent a cable inviting him to come to Baku as soon as possible. Lindley arrived in October and stayed there for two months. During his visit, he went to the countryside to examine the geological structure of the surroundings of Baku. He found that the Kur River had the best water resources and was most suitable for supplying the city. Unfortunately, it was 120 km from Baku, in land that was densely populated. A project that connected to the Kur River would require a sophisticated, expensive system for transporting and filtering the water. When Lindley reported his findings to the Duma on December 18, 1899, he suggested the possibility of getting water from the Caucasus mountains, especially the area of the Gusar river and the Gil forest. Assisted by a detachment of Cossacks, he had visited two springs called Shollar and Fersali. There he had found a large quantity of pure water that would meet the current, and, what he thought would be the future, needs of Baku. Since the springs originated at a high elevation, the water could flow for 40 km due to the sheer force of gravity. Right: Shollar Water Early 1900s. Above: Laying of the water pipes through Balakhan (now Fizuli) street. Lindley's next visit to Baku was in May 1901. After a well-prepared, professional lecture to the members of Duma, he convinced the government to let him proceed with the project. On June 23, 1901, the contract was ratified. For the entire design and execution of the waterworks, Lindley was offered the handsome sum of 35,000 rubles. Of this amount, 25,000 rubles had been offered by Azerbaijani oil baron and philanthropist Haji Zeynalabdin Taghiyev (1823-1924). Lindley's project was scheduled to begin on January 1, 1902. In the meantime, city mayor A. I. Novikov embarked on a long journey to Western Europe to visit the water supply enterprise in Frankfurt, Germany, which had been designed and supervised by Lindley and his father, William Lindley (1808-1900). After visiting the water plant, Novikov became a strong admirer of the spring intake. When he returned to Baku, he insisted that Lindley include both underground and spring intakes in his water supply project. Left: Surakhan (now Dilara Aliyeva) Street. By the autumn of 1903, two of Lindley's representatives had arrived in Baku with the plans for the final project in their hands. The pipeline would tap the Kur and Samur rivers, with intakes located at a distance of 125 and 170 km from Baku. Formalities concerning the contract were completed on October 23 that year. Drilling works were assigned to a French company, under Lindley's supervision. At last, the real work began on January 3, 1904. 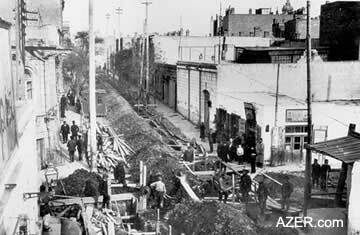 The revolutionary events in Russia (1905-1907) had a negative impact on the waterworks project in Baku, causing it to be delayed. This revolution is often recognized as the first revolution of the industrial era in Europe. It began on the so-called "Bloody Sunday" in St. Petersburg (January 22, 1905) and resulted in a wave of solidarity strikes sweeping through the industrial regions of the Empire. The impact was not felt in Baku until 1906, when the second wave of revolutionary action by soldiers and sailors took place. These events in June 1907 let to the dissolution of Russia's Second State Duma. At the time, the Duma journal "Izvestia Bakinskoy Gorodskoy Dumy" stated: "The bloody events in Baku entirely paralyzed the economy, stopping work on the city's water supply." Only after N. V. Rayevsky was appointed as the new city leader in 1908 was Lindley able to resume work once again. In the meantime, Baku's problems grew more acute. Outbursts of cholera in 1907, 1908, 1909 and 1910 spread fear among the populace. These outbreaks were related to the poor quality of the water supply and sewage system. Baku residents had even developed two different words for good water and bad water. Lindley reported that they called the impure water "gara su" (literally, black water) and the pure water "agh su" (white water). Lindley often spoke about the difficulties of fulfilling such a major project to supply Baku with water. He is reported as saying, "In Western Europe alone, I have carried out water-pipe and sewerage constructions in 35 cities. But I have never had to deal with a work of such technical grand scale and difficulty as the construction of this water pipe." Above: Pipeline for Shollar Water brought water from the Caucasus mountains, 170 km from Baku. Made of porcelain, it was the longest water pipeline for its time in Europe or Russia. Completed 1917. The 1912 edition of Illustrated London News praised Lindley's achievements in an article entitled, "Water for a Great Oil City: Building the Longest Conduit in Europe": "The construction of reservoirs and a conduit for the supply of water to the city of Baku constitutes an engineering feat without parallel not only in Russia but also in Europe. It is the scheme designed by and being carried out under the direction of Sir William H. Lindley, M.Inst.C.E., F.C.S., whose works during the last 40 years have made his name famous throughout almost every country on the Continent.Construction of the Baku Waterworks will form an engineering feat, consisting as it does of the making and laying of a conduit over a distance of 110 miles (the longest pipeline in Europe) at the hitherto unprecedented rate of one mile per week. The pipeline will be large enough for a man to walk through, and is guaranteed to convey 25 tons per meter, as a minimum load." 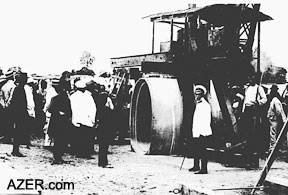 Despite the onset of World War I, work on the pipeline continued. The demand for water in the city grew steadily as well. According to the Duma journal, Lindley paid his last visit to Baku in January 1916. On January 18, he delivered a lecture on the prospect of supplying the industrial regions of Binagadi and Surakhani with water from the Shollar intake. During that visit, the city of Baku granted him honorary citizenship. This was the last document that confirms anything about the journey of Sir William H. Lindley to what was then a remote part of the Russian Empire. News from the frontlines, then the Bolshevik Revolution, meant the end of the world that he knew. Lindley passed away peacefully in December 1917, of a stroke, in his home in London, at the age of 64. Today the Shollar water system is still considered to be the best water source for central Baku both because of its superior quality and dependability of distribution. Dr. Ryszard Zelichowski is a historian with the Institute of Political Studies of the Polish Academy of Sciences in Warsaw, Poland. He has published a number of articles and a book (in Polish) on the Lindley family's activities in Warsaw and other countries. His most recent book is a 450-page biography of the Lindleys, in Polish, focusing on three geographic areas: England, Germany and the Russian Empire (including St. Petersburg and Baku). Contact him via e-mail at rzeli@omega.isppan.waw.pl. For more information about the Shollar water pipeline, see "Shollar Water: A Century Later" in AI 7.3 (Autumn 1999). SEARCH at AZER.com.